Hey guys! If you have me on instagram, then you have most likely seen this combo already from when I uploaded a photo of me from a day of glorious shopping. It is the perfect summer evening outfit for so many reasons! I tend not to go for overly colourful outfits so I was a bit surprised that I picked out the blazer and the trousers from Primark, intending on wearing them together. The trousers are so loose and airy which make it a great piece of clothing to relax in at home, but the crazy print makes it an amazing pair of trousers to wear on a night out. There were so many prints and colours when I was shopping that I might have to sneakily head on back to Primark and get a few pairs. This blazer is a lot shorter than most blazer I own so it will also be great for when I wear high waisted skirts, shorts or loose fitted trousers like these. Sometimes shopping in Primark can be a nightmare and a lot of the time Primark clothes can be a bit "iffy", to say the least. But on depending on what is worn with what, an outfit from Primark can also be classy. PS, nominations for the 2013 Cosmopolitan blog awards are now open and I would greatly appreciate it if you could nomiate me (here) in the best established fashion blog category (blogs over 1 year old) - thanks so much in advance! super sweet outfit. I love your pants! 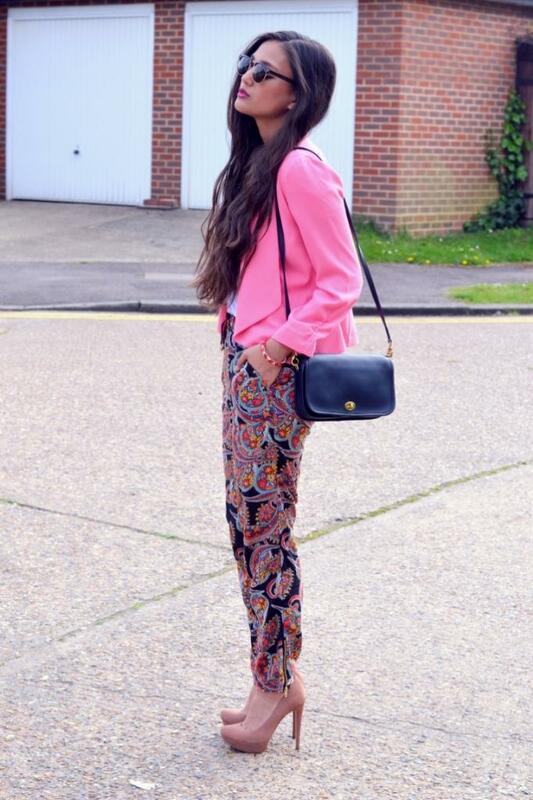 Gorgeous pink blazer and trousers!! That blazer looks great with those pants. I love the necklace, too!